Before my recent 10-day trip to India there were a lot of questions to be asked. Why would you go there? Is it safe? Why are you taking that risk? – those were the questions my mum was asking. Which vaccinations should I get? How to avoid biting monkeys? What will I eat that is not too spicy? – that would be my best friend, who was going to join me. And finally, the questions roaming my mind: Which places should I see? How does transport work? 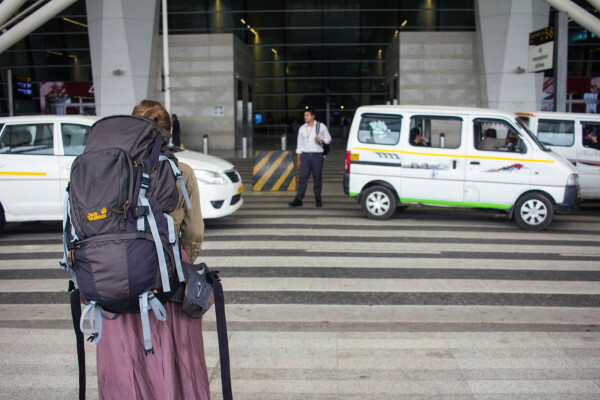 How can I prove that India is safe to travel as a woman? Clothes were not the only thing on my list; I also thought about shoes (duh), toiletries and other essentials which might be handy to have. Now, that I’m back from my trip I thought I’d round up my experiences and share my ultimate Travelettes packing list with you. Here is what I took for our trip to humid and hot India. When I travel to a hot country and know I will be moving a lot with my luggage, I swear by my 40L backpack from Deuter. It fits everything I need for up to three weeks, is easy to carry and not too bulky. Initially, I meant to even take my backpack as hand luggage with only an additional bag holding my laptop and camera, but it ended up being to heavy for the airline restrictions. From now on, I’ll make sure to check on these restrictions on this ultimate hand luggage cheat sheet I found on Expedia. In addition to my checked backpack, I also took a spacious shoulder bag for longer journeys and my Bowhurst explorer backpack to always have my essentials with me when sightseeing. As always I’m also carrying several smaller pouches with me to store spare camera equipment, tissues and lip balm etc. That’s my best friend’s Jack Wolfskin backpack, which seemed a little bulky to me, but is one of those handy front loaders. Even though baking heat and covering up most of your body don’t seem to go along very well, this was of course what I had to go for when putting together my wardrobe. As a woman, covering your shoulders and knees is not only the appropriate and respectful thing to do, it will also make you stand out less from the crowd (although, you will still be stared at if you look slightly foreign). 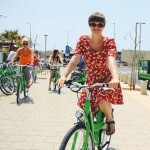 It is also the safer option, as any kind of skimpy clothing might send the wrong signals (unfortunately so…). While we did see several other white travellers showing their shoulders or legs, I myself would not have felt comfortable with it. 7 plain short-sleeved T-Shirts. In my experience it is better take a few spare ones and keep at least one clean t-shirt for the return flight (you can thank me later for this advice). I mainly went for plain, uni-color t-shirts so I could mix and match – as it counts for most trips, white is not the best color to travel with. 1 long-sleeved tunic. This was not really necessary, but just served as an additional top. You could wear it on a day you visit a temple or mosque for additional cover-up, or keep it for the plane when the A/C hits you. 1 thin cardigan to cover up. Although I love my purple cardigan from Kamah Yoga, I barely wore it, because I felt so comfortably with my t-shirts only. It added a nice splash of colour to my outfit though. 1 thin, but long-sleeved coat dress to cover up. I had bought this block print coat dress a few years back from the Swedish label Gudrun Sjoeden (which is a great label if you are into fair fashion and ethnical prints). I wore this a lot, mainly because it made me stand out less among the patterned dresses of local women. 2 loose trousers. Long loose trousers are my choice of bottoms when I travel to a hot country. Shorts are great on the beach, but in India they would be totally inappropriate. With long trousers you also need not worry about sunburn, or splatters of dirt on your skin. I took one pair with black and white print, and one plain beige-coloured (which turned out to stain very easily, so maybe a darker colour would be better). 1 printed maxi skirt. To not only wear trousers all the time, I also took my favorite maxi skirt with a wild yellow-pink pattern. Again, it matched several of my t-shirts. 1 long dress. I took a plain back dress (as recommended by The Travel Hack) and think it was the most useful item of clothing that I had throughout the entire trip. The only additional comment I’d have, is that a dress with short sleeves would have been even better (mine had thin straps), so I could have worn it without a cover up. 1 yoga-wear jump suit. As we were heading for Rishikesh, the yoga capital of the world, I brought my yoga jumpsuit from Kamah Yoga. However, we ended up not doing yoga, because it was simply too hot and I was never a fan of Bikram style… The jumpsuit was still good for a change from my loose trousers. Jump suits generally not advisable on days of traveling though, as going to the toilet with a onesie is rather inconvenient. As mine is convertible to normal trousers, I wore it on the plane home – fresh and clean. 2 big scarfs. Scarfs are amazing in situations where you feel uncomfortable – you can cover your body with an additional layer, or even your face, so people don’t see that you are a foreigner immediately. Also, as A/Cs are everywhere, a scarf helps not to freeze. 1 waterproof jacket. Another item, we luckily did not need at all – the monsoon had not really arrived yet and we never got caught in a serious rainstorm. For peace of mind, I’d still take it again. Underwear and socks. This is a no brainer, I know. There are a few tips around underwear and socks though, that I want to share: take quick-dry underwear, because cotton might not dry in the humid air; take more bras than you think, because a sweaty wet bra is among the most disgusting things to put on in the morning; bring socks to wear in temples if you don’t want to walk barefoot. I ended up bringing way too many shoes – again because of the anticipated monsoon rain, which did not show. I brought my beloved Birkenstock flip-flops, which in the two years that I owned them have accompanied me halfway around the globe and still feel like new. They are just perfect for walking around for hours and are comfortable even if it rains. I also brought a pair of light sneakers (Vans), but only wore them on the plane and when sneaking into the abandoned Beatles ashram in Rishikesh. I never even unpacked my second pair of sneakers which I brought as a backup. Make sure that you break in your sandals or flip flops properly before your trip. Your feet will swell in the heat, and new shoes could give you blisters! As I mentioned above, I packed my backpack as I would do with hand luggage – completely along the line of airline restrictions on liquids. I used refillable bottles for sun lotion and moisturizer, and went completely without liquid shampoo, conditioner or shower gel. 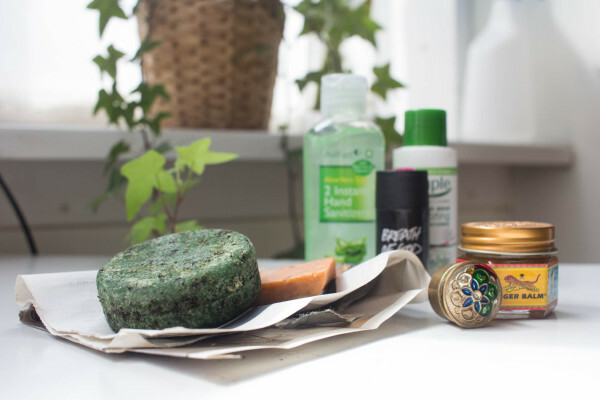 I simply bought all items in solid form from Lush – although I have to admit, that my conditioner and soap bar melted a little bit the first couple of days. In terms of make-up – don’t even bother. I sweated so much, that everything would have just ran down my face anyways. If you can’t do without, go for waterproof make up! One item, I wouldn’t want to miss is my pack is facial wipes, which double up as hand wash and wet toilet paper. Some regular toilet paper is a good call as well, as often there is none (in restaurants or toilets along the highway). Bringing a basic medical kit is only just common sense – it should contain (blister) plasters, wound cleansing spray, meds for diarrhoea, hand sanitizer and insect repellant. As we were sweating away, queuing up for enter a particularly popular temple in Haridwar, I started longing for a folding fan, and wondered why not more market stalls offered them. This definitely goes onto my packing list for the next trip! Another effective way to cool down would have been a refreshing face spray. Although I read beforehand, that withdrawing cash at an ATM with a foreign card should be no problem, I still took us an hour to find a working cash machine accepting our cards. 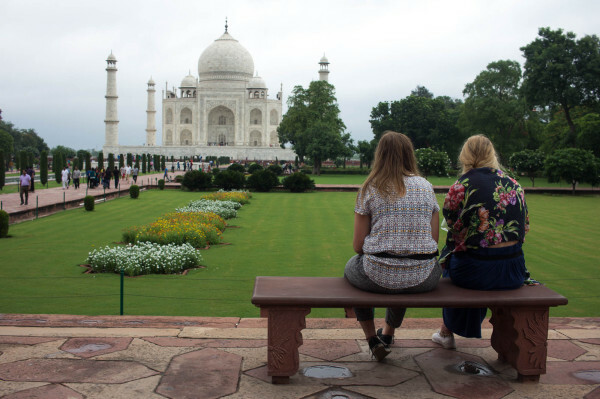 And that was in Agra by the Taj Mahal… My advice would be to bring enough cash (USD, EUR, English GPB are easiest) to exchange your currency to Rupees, so you don’t have to worry about finding an ATM. – and also plastic flip flops for certain hostel/hotel showers. – Don’t pack too much, but buy clothes cheaply at local markets – counts particularly for scarfs and kurtas (Indian everyday tunics). One final remark, before I leave you researching flights and itineraries around India, is to pack really, really light and leave enough space for souvenirs. The markets here burst with cheap but beautiful clothes, jewellery and home decor, it would be a shame to arrive with a full backpack. Better come with a half empty one and shop ’till you drop! Have you been to India before? Which items would you recommend to take there? This article contains one sponsored link. Really insightful list, thanks for sharing! I desperately want to take a trip to India, I'll definitely keep your tips in mind whenever it comes time for me to pack for it. That's quite a useful packing list you got there. I am form India and frankly it's not as bad as it sounds as you wrote it. Its definitely conservative if you are travelling in places which are of worship but otherwise u can wear clothes which are sleeveless and whatnot . Hopefully the next time you travel it would be to explore the other great places India has to offer. Another useful tip is if you have an acquaintance in India it'll go a long way in bargaining for souviniers here in India. People are quite helpful ask any other Indian tourist and they would help you get a fair price for your purchases. Great places to see are the Andaman Islands and northeastern states as well. Yes, I definitely need to go back! Loved it and haven't seen a fraction of what I hope to see in India! I think the fact that we were there just now, off-season, added to the fact that we were already standing out enough due to our skin colour. If I then in addition would have been the only woman around with bare knees or shoulders, it would have just attracted too much attention. I felt more comfortable - and more dressed like the local women - with sleeves, even in Delhi. That said, we saw a few travellers with tank tops and/or shorts and nobody looked at them weirdly or said anything. Great tips! I have been to India 3 times around a week each time. The plain t-shirts tip is very useful, i would recommand to bring some ethnic jewelry it makes every outfit nicer and fits with the local surrounding. For my second "touristic" trip to the north I was ready: bought larger ethnically trousers (brands like etam and nafnaf in France makes them in really nice colors). As I am a caftan fan I made sure I had space in my luggage for all the silk I could buy in India. I also bought some local outfits that I used in other Asian countries. For those who want to discover India go to the further north and/or the further south. I love Indian food but I discovered there that's what I loved is what they call "indo-Chinese" cuisine. I needed to ask thé guides or my friends to find a local restaurant that makes this type or cuisine. Voilà hope to again soon! I ended up buying a few traditional Indian outfits to cope with the humidity . The scarves were especially useful to bunch over my nose when smells or diesel fumes from the auto rickshaws were too overwhelming. Indians will stare at you anyways, no matter what you wear (just regard it as curiosity) but I also had the feeling that it's better to dress more conservative and you never have to worry when you want to visit a temple. As for the ATMs, I never had a problem, maybe it depends in your Credit Card (I used DKB). Bring sunscreen (should be obvious) and make sure to get some mosquito repellent (Odomos is the local brand, all natural and works well) - especially during monsoon. For your 2 scarfs, just leave them at home and buy them in India as the choice is endless. Make sure to find a trustworthy seller to get good quality. Always take a headlamp as power outages can happen quite regular (especially when it's raining). I recently spent two months traveling in India alone (as a white female) and can agree with most of what you are saying, although it definitely depends on where you are in India! 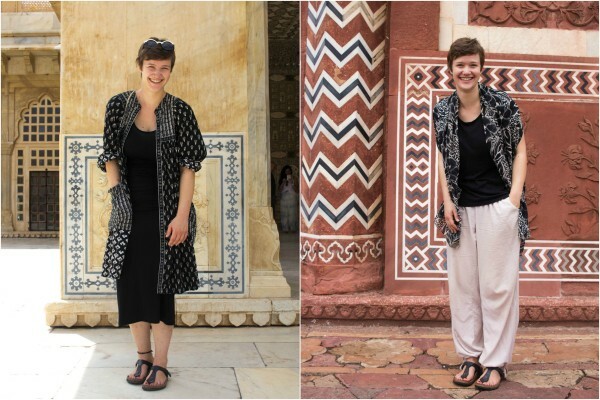 While I was in Delhi and northern India I always had my knees and shoulders covered - easy enough to do with long skirts/dresses and scarves, like you mentioned. However I also spent a month in Goa and you can wear whatever you want there; bikinis, sundresses, shorts, etc. and feel completely comfortable. Great list though! 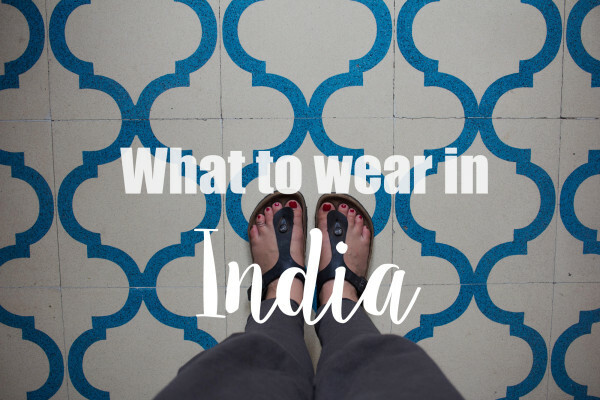 I'm more intrigued to visit India and was glad I found an informative post like yours featuring what to wear. It's good to know what is appropriate and acceptable to wear so you don't offend anyone. It's also good to have lightweight pieces like yours for comfort. Thanks for the advice! This is a good list. I would definitely take out any snickers option and got instead for plastic flip flop. Much lighter and can come handy in some hotel bathrooms. And add some soap sheets boxes. Always very happy to have these anywhere! If you want to travel light, you can go to any market when you arrive and by one or two kurtas. It's the everyday tunic and it's very light, comfortable and it really looks great. To avoid soap melting, I got a trick that totally changed my life! You can use a potato peeler and create flakes with your soap. A girlfriend shown me that trick and I love it and use it all the time! No more gross melting soap in my backpack and feeling of the dry soap is so much better :). Won't the pieces melt together? or do you pack them individually? This is the list I have been searching for! I am off to India in the new year and alway love to take advice from those that have actually been when visiting somewhere so culturally different as I would hate to be accidentally disrespectful. This is extremely useful. I have been to India a few times and think your list has everything you need! Thank you for adding the brand of your gorgeous coat dress. I wouldn also add sunglasses for the obvious reason that it's sunny but also it really helps avoid having to look into the eyes of staring men in crowded trains of squares. And on my first trip to India I also wore a fake wedding ring which really saved me one time from a very pushy and annoying guy. I told him I was married, showed him my ring and he immediately left me alone. Awesome list! Birkenstocks all the way - watch out in the markets, there are some really good imitations that won't last a week! I can also second the mention of Odomos mosquito repellent, it works far better than buying a foreign brand to take with you (in Goa I have been bitten through my trousers whilst coated in Jungle Formula!). Hi, I'm going to India for 18 days and your posts have been of amazing help, thank you so much! but I've one question that I just can't seem to give up, is it necessary or not to get all the vaccines? I called the embassy and they said that no because I wasn't going to be there more than a month but I'm still struggling with it since so many people recommend it, can I have your opinion please! Hi Mel, I wouldn't necessarily say, it matters all that much how long you stay, but where you are going. I didn't get any vaccinations, because we didn't go to any tropical regions - otherwise I would have probably gotten a yellow fever shot at least. Why don't you talk to a specialised travel practice -they should know? Have fun! Hi Kathi, thank you so much, we are only going to New Delhi, Jaipur and Agra so no, I'm not going to a tropical region but still, thanks for the advice! It's a great list. Thanks for compiling it. You mentioned that you used a backpack for sightseeing. While I will defo take a backpack as check-in luggage, I was wondering whether it is safe to use out and about and would value input.